My son’s HS band is performing in a competition tomorrow in Midland and I’m going along to volunteer on the pit crew for the show. It’s a long drive, and it’s state or US highway the whole way. No interstate. Fortunately, the speed limit is 75 in most parts of rural Texas. If the band makes the finals, they won’t leave the stadium until close to midnight. If that happens, I’ll get a hotel and head home on Sunday morning. 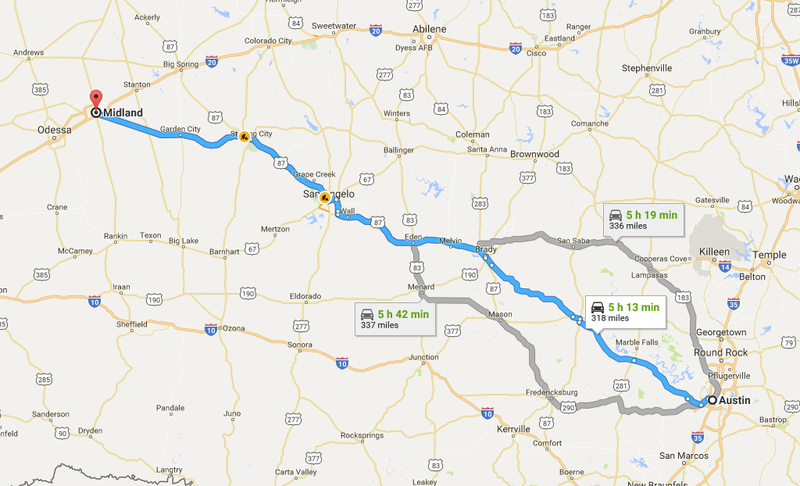 I’m a sucker for a long drive (road trips run in our family), and I’ve made the drive to Abilene over a 100 times but never been over to the area around San Angelo. And the first part of the drive out through Marble Falls is some of the prettier parts of the Hill Country.